That moment with Luis in the taxi, April 11 2006, was not the beginning of the story for me. Turn the clock back to January 21 of the previous year. Seated next to me on a plane flying south from Santiago, Chile’s capital, was a young man, Paul, reading the afternoon newspaper. He spoke English fluently and talked fervently. I was flying to the southernmost town on Earth, Puerto Williams, to take up a job on a charter yacht : 6 weeks of sailing Cape Horn, the Beagle Channel and climbing the mountains of Tierra del Fuego. He was travelling to Temuco, a city just north of Valdivia, for a weekend of sunshine and relaxation with his girlfriend. The first of the two headline stories in the paper he was reading concerned the suicide of one of Pinochet’s former military henchman implicated in the murder of thousands of dissidents during the Pinochet dictatorship following the overthrow of the democratically elected President Allende in 1973. The subject is a touchy one in Chile, which is to be expected, and the young man was discomfited by my interest, but paradoxically pleased that I knew something of Chile’s history, amused as well that I judged the military officer’s suicide to be 30 years too late. He wanted to get off the subject and drew my attention to the second headline story, a far more urgent problem than ancient history he assured me. The second story concerned the recently commissioned CELCO paper pulp mill (cellulose plant) in the Valdivia region of southern Chile. Pollution from the mill had caused an environmental disaster. There were dead swans. Social unrest. An outcry. Calls for the mill to be shut down. Much worse, said Paul, was the personal part he played in the disaster. He was an architect, and the firm he worked for had been involved in the design and construction of the pulp mill. He felt morally implicated. The environmental catastrophe, he said, was Chile’s “international shame”. The plane landed in Temuco, hit terra firma like a brick and bucked and slewed up the flooded runway in an explosion of water. The passengers clapped because the pilot brought the plane to a stop before it careered off the end of a runway that seemed much too short for landing in a deluge. So much for Paul’s weekend of sunshine in Temuco. I flew on south to the land of storm and ice and thought nothing more of paper pulp mills until I arrived back in Tasmania in March 2005. To a storm of a different kind. We were going to get our own pulp mill. Not a closed loop, chlorine free mill as promised before I left for the uttermost ends of the earth, but an “ordinary one” said the CEO of the company that proposed to build it. Nor was it going to be located outside the environment in a place like the Hampshire Hills, fed by the plantations that had consumed the landscape there, but in everyone’s backyard on the banks of the Tamar River, adjacent to the woodchip mountains at Longreach, where Tasmania’s forests come down to the sea, the same native forests that would feed the pulp mill. While ‘independent’ pulp mill study groups went to Europe, Canada and China (financed and peopled by the very groups; company, government, chambers of commerce etc. that, on the whole, supported the proposed pulp mill as an article of faith) and returned with glowing reports of the social, economic and environmental benefits of pulp mills, there was an apprehension in Tasmania that the reports were just too rosy to be true. Or irrelevant to the Tasmanian situation. Especially when the CEO of the company that proposed the mill said, disarmingly, that he had no intention of building a European style mill. What model of mill did he plan to build then? Attention shifted to the ‘global south’, an expression that has a strong whiff of neo-colonial exploitation about it. To South America in fact, where European companies are currently ‘relocating’ pulp mills, because, quite simply, it is cheaper, and, dare I say this, environmental regulations may be less restrictive or at least negotiable? In November 2005, a study group of two people from the Tasmanian Government’s Pulp Mill Task Force (Dario Tomat) and the then named Department of Primary Industries, Water and Environment (Stewart Johnson) visited Brazil and Chile. 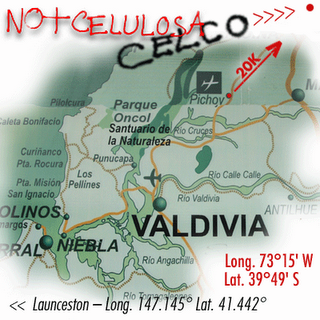 Their report, published in April 2006, was, in relation to the CELCO plant near Valdivia, mostly accurate as far as it went, which wasn’t far enough. While the report mentioned the dramatic loss of the swan and herbivorous bird populations due to the “severe and widespread decline of an aquatic plant”, it gave no scientific detail, which I believe was available at the time in Chile, instead, dealing with the huge issue of the ecological collapse of the wetlands with the lame assessment that “reports were inconclusive on the cause of the plant decline”. On the contrary, reports on the “cause of the plant decline” were very clear, and had been for some time. Enough of their report for now, but I will return to it later because there is one stunning sentence in the concluding dot points which warrants an autopsy, followed by the application of a flamethrower. 1. Initially CELCO intended to discharge its liquid effluent into the sea but violent protest from fishermen (characterized as ‘natives’ by Marianela) whose livelihood depended on an unpolluted sea, dissuaded the company from proceeding. The violent protest included the smashing of monitoring equipment. 2. Because of environmental transgressions the mill was forced to shut down three times by the courts and by the regulatory authorities: April 2004, January 2005 and April 2005. Many people in the audience in Launceston doubted if the courts and the regulatory authorities in Tasmania either enjoyed, or were prepared to exercise, anything like the same powers as in Chile. 3. On the question of community reaction to the dying swans, Marianela said the average person only started to be concerned when swans fell out of the sky and crashed through car windscreens. During her presentation it became apparent to me that we in the Tamar region, who were about to receive a pulp mill, had a lot to learn from the Valdivia experience, and that we had better learn it fast or be condemned to repeat history. I resolved to go to Chile at my own expense and educate myself on the social, economic and environmental consequences of the CELCO plant.